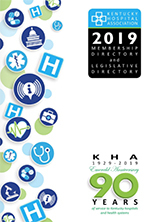 The KHA Annual Convention will be held at the Lexington Convention Center, which is attached to the host hotel, the Hyatt Regency Lexington. Ample parking is available immediately across from the Hyatt Regency/Lexington Convention Center. The Daily Rate for the lot across the street is $8 daily. Parking is complimentary for hotel guests. From I-75 or I-64 (any direction): Take exit 113, the “Paris/Lexington” exit, and turn right onto Broadway. Follow the “Downtown Lexington” signs for three miles. Turn right onto High Street, and then make an immediate right into the driveway. From Frankfort, Bluegrass Parkway, or the Bluegrass Airport: Follow the signs to US 60 East (Versailles Road), into Downtown Lexington. When you reach Downtown you will be on Maxwell Street. Turn left onto Broadway, and then make another left onto High Street. Make an immediate right into the driveway. From US 27 (Nicholasville Road) or US 68 (Harrodsburg Road): Follow your route into Downtown Lexington. Turn left onto High Street and then make a right into the driveway. KHA wishes to take all steps necessary to ensure that no individual with a disability is excluded, denied services, segregated or otherwise treated differently than other individuals because of the absence of auxiliary aids and services. If you need any such assistance or services, please contact KHA at (502) 426-6220 by May 5. During the KHA Annual Convention business casual will be appropriate dress for all events. Keep in mind that it is difficult to regulate temperature in meeting rooms. We suggest a sweater or jacket.